Wishing myself on a beach under a palm tree. — Allen McGregor/Flickr. Can you blame me for wishing I could escape this bitter winter and head off to warmer climes? I’m dreaming of sandy beaches and palm trees, yes I am. On my first trip to the Caribbean many years ago, I stayed in a tiny, bougainvillea-covered cottage perched at the edge of a cliff that fell to the turquoise sea. I can close my eyes and see it still, white stucco and magenta flowers. At night, the soft air was like wine and the sounds of the place were memorable. Beneath the raucous crowing of roosters and the plaintive baying of goats was the constant rattle of palm fronds lifting and tossing on the trade winds. That papery rustling must be one of the most soothing noises on God’s green earth, evocative of moonlit beaches and southern isles far from ordinary trouble and woe. Hasn’t someone made a long-running audio loop we could play all night in our northern latitude bedrooms? One summer years ago I acquired the first palm of my own as the biggest (and least expected) of birthday presents. Just shy of six feet, it was intended for my terrace, where the impatiens and gaudy tropical foliage plants lived. The first thing I wanted to know about my patio palm was this: Does it rustle in the wind? Can it be made to rustle, perhaps by shaking it vigorously? The specimen in question was a majesty palm (Ravenea rivularis), and apparently mine was just a youngster. This species can grow rapidly to a height of 10 feet and a width of 16, with its skinny trunk potentially swelling to a circumference of nearly 6 feet. Whoa! Given my 8-foot ceilings and smallish rooms, this could be touch and go come cold weather when Mr. Palm would want to winter inside with me. For the time being, it seemed right at home on the terrace in the dappled shade of the locust trees, and there it stayed for the next month or two. I’ve read that palms like to be somewhat root-bound and will live happily in a pot relatively small in comparison to its leaf mass. It did fine with nothing more than ample water and a dash of diluted fertilizer from time to time. Surprisingly, there are several species of palm that can survive outdoors in our temperate climate. The needle palm, the windmill palm and another known as Sabal minor don’t grow to full height without year-round warmth, but dedicated palm nuts correctly point out that they can get through our winters — although perhaps not happily. 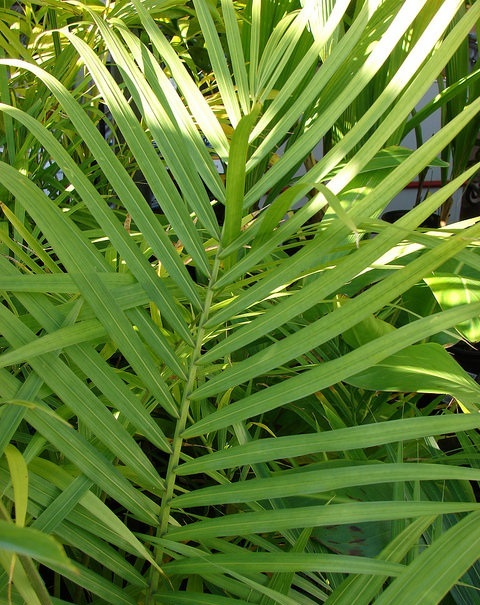 By far, the large majority of palms are addicted to warmer conditions. Tropical palms have been popular houseplants since the Victorian era, when the parlor palm was the decorator accent of choice. These were mainly of the genus Chamaedorea and other types that can make do with low light and humidity levels. Houseplant fashions come and go, and the palm has had to vie with other trendy plants, including orchids and lucky “bamboo” (really, not bamboo at all, but a kind of dracaena). Still, how many other plants once figured in a political scandal and inspired an indelible figure of speech? Actually, I had wrongly thought the words were those of Fawn Hall, North’s witless secretary, who defended her destruction of official paperwork by saying there were “times when you have to go above the written law.” But this is the same woman who, through clerical error, deposited $10 million extorted from the Sultan of Brunei — a sum meant to buy weaponry for Nicaraguan rebels — in the wrong secret Swiss bank account. Help! I’m waxing nostalgic about the quality and tenor of sensational bad behavior among our duly elected representatives in days of yore. The scandalous news from Washington these days has my blood pressure racing and my stress levels in the red zone. I’ve got to get a grip and return to pleasanter memories of time spent on Caribbean beaches in balmy tropical climes. I need to distract myself from current affairs (pun more or less intended). It’s a plan. And it’s totally legal.